Bueil is a charming village on the westernmost side of the Coteaux-du-Loir appellation area, the northernmost wine region in France which is home country for Pineau d'Aunis and Chenin. The Coteaux-du-Loir area sits on two départements north of the Loire river : 16 villages in the Sarthe and 6 villages in the Indre-et-Loire. This lesser known wine area has still deep roots, its origin unsuprisingly going back tho hard-working monks in the Middle Ages. 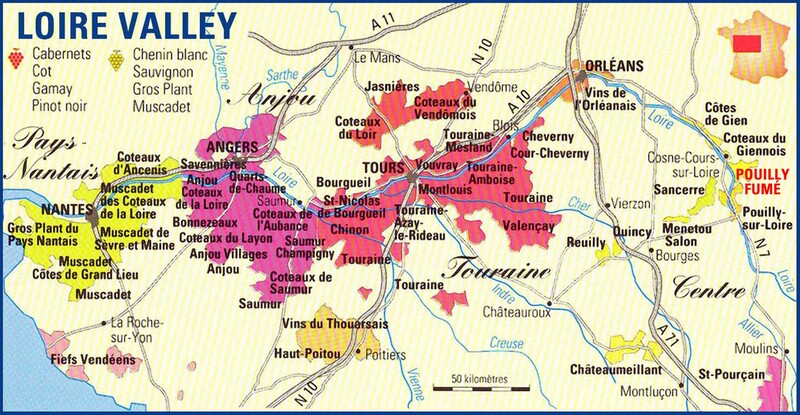 When writing on the region, I always link to the extensive Coteaux-du-Loir page by Richard Kelley where you'll learn what is the Loir compared to the Loire (no mispelling), the peculiarities of this terroir and more details on when the Pineau d'Aunis was first planted by Benedictine monks near the village of Chahaignes (9th century). On the Loire-region map I linked to above, the Coteaux-du-Loir area is roughly in the center near the top, this is the separate red patch above Tours, standing together with Jasnières and the Coteaux du Vendômois with which it shares more or less the same history (Chanin and Pineau d'Aunis being the major varietals there). While the region of Bueil is mostly cultivated for mainstream crops like corn or wheat (because the vineyard part has dwindled since the phylloxera devastation a century ago), you still find a few parcels planted with vines here and there and there are everywhere architectural remains in the villages or at the foot of the hills proving a long winemaking history through the presence of many cellars, often former quarries conveniently turned into chais and cellaring facilities. Renaud Guettier, whose parents are in the teaching sector, was trained originally as an agronomist specialized in plant physiology, his initial purpose being to work in the research sector in that field. But he understood quickly that the life in the research labs was not what he ticked for, and he soon left for Africa where he did some development work. Back in France in 2003 with his wife he looked upon working along his father-in-law who was a multi-crop farmer in Bueil, at the edge of the Coteaux-du-Loire. Wine was just one step away. He now makes beautiful Pineau d'Aunis and chenin wines without any added SO2. The father of Renaud's wife was a farmer growing crops and raising meat cows but he didn't have vineyards, unlike his father who had had some parcels but had uprooted them like most farmers in the years following world war two. When Renaud and his wife came back from Africa, he considered making wine in this region which he knew had a good potential and terroir. He was already an amateur of fine wine including natural wine and wasn't put off by the rarity of vineyards in this farming landscape, he saw all these cellars here and there and noticed that a few vineyards had survived the expansion of generic crops. Renaud enrolled in ENESAD for 18 months (AgroSup Dijon) in Burgundy to get the needed schooling for his new orientation, plus a 6-month training which he chose to make at Domaine de Bellivière with Eric Nicolas not far from here. While in Dijon he had also short trainings, meeting for example Emmanuel Giboulot as he was already an amateur of his wines, ans spending time at Louis-Latour, a respectable family winery in Burgundy doing a good work in the vineyard. His father in law having no one to take the farm after him, Renaud decided to take a few parcels of vineyard and work also in the farm with the objective of managing the farm himself after his wife's father would retire, which happened in 2007. the farm work allowed him to make a living through growing crops all the while rejuvenating vineyards and setting up his winery. He first purchased a 0,5-hectare parcel to an elderly local, his goal was to find available surfaces here and there (they're scarce in this part of the Coteaux-du-Loir) and grow little by little. This first parcel was located id Dissay-Sous-Courcillon, 8 km from Bueil. In 2005 he found another parcel, a rent this time, then 2 or 3 others to buy in 2006, then others to rent, and little by little he managed to make wine from a collection of 25 old parcels (today) stretched on a radius of 7 km and making a total surface of 6,5 hectares. These vines have an average age of 80 (the oldest being 110) which is also very valuable. Renaud drove me with his van to a few of these parcels, and on the way, he stopped on the road to talk to his worker. Old Pineau d'Aunis While driving in the area to visit a few parcels and his cellars which are also at some distance from the farm, I was surprised to see that the region was not uniformly covered with large wheat fields like I had initially the impression when nearing Bueil : due to the hilly nature of the area, the landscape is actually very diverse, with small roads winding through prairies and woods as well as fields bordered by traditional hedges, in short what we call a bocage in French, something that has been increasingly replaced since the end of WW2 through farm consolidation by large uninterrupted fields with no hedges in between. Watch this short video which I shot holding the cam in front of the windshield while Renaud was driving from one of his parcels to his cellar, you'll understand what bocage means, it's pretty well like traditional farmland crisscrossed with small roads that were all dirt roads 60 years ago. At one point the van stops because Renaud was loosing the signal on his phone. Renaud Guettier makes roughly 50% of reds wine and 50 % of whites, and I came here mostly for his red Pineau d'Aunis, a grape variety you have today a hard time to find in wine shops, first because of its rarity and because conventional wineries and coops often make a bland, uninteresting rosé out of it. pushing the vines to fall and re-root from the trunk. Some of the vineyards Renaud recovered had been abandoned for a few years and a few vines were damaged when they uprooted the bushes and brambles that had settled in. One of the positive side to rehabilitate vineyards this old (70 to 110 years) is that for most of their life they were farmed the old way with regular plowing, thus having developed deep roots over the first part of their life, some of them having even been plowed until the 1980s' by elderly farmers committed to this frugal farming. This plot makes one hectare, Renaud bought this parcel of pineau d'aunis in 2005, he had to change everything here, the poles the wires to rehabiltate it. You have to protect these parcels against wild animals including pheasants otherwise you don't pick much volume. Most of tyhese vines had really very few clusters, often just 2 from I saw, the yields on these old vines must really be low. This year he says, he sprayed 6 times comapred to 3 in what we'd call a normal year, the wet weather of june and july have pushed up the disease pressure but he says there wasn't mildew at the end. The Pineau d'Aunis doesn't make thick trunks when they age, Renaud says, what strikes me is the convoluted shape of these old vines, which are pruned in flat goblet with the branches in the same plane. Look at the unmistakable color of pineau d'aunis (picture on right), I can't understand this varietal has been largely pushed to the side in the Loire valley by the appellation authorities when it was at home in much of the region back a century ago and it can yield such beautiful reds. At least in the Coteaux du Loir and the Coteaux du Vendômois ir retains one last bastion it can claim as its home. A private parcel with orchard As we were driving away from this first parcel on the grass road, we saw a small parcel with an orchard along it, this is the type of parcel Renaud tries to recover when their owners discontinue their use (the wine they make here are like the fruits, for family consumption). The trick is convince them either to rent it to you or even possibly sell it, which they may see positively if they know that you'll keep the small vineyard alive. But many farmers are only focused on how much money they'll do and they are tempted to just uproot the whole and merge the parcel to the adjoining field to make more wheat or whatever generic crop they grow, because financially the rental return would be small anyway. Renaud says that this small parcel is obviously conventionally farmed, the pruning left very long branches and the fruit load is quite big compared to his own old parcels, although it's not sure he put some fertilizers. It wouldn't take too much effort to make good things with this parcel, actually. More Pineau D'Aunis The next parcel we stopped at was the first one he purchased in 2004 (les Druillats), it's a plot he still hesitates to uproot but he has been keeping it until now. there are 12 ares of white with 40-year-old vines and the rest is a base of pineau d'aunis complanted over the years with all sort of things, grolleau, côt, gamay and even a bit of pinot noir to cite a few. There was even all sort of hybrids in there which he uprooted when he learnt to recognize them, which was not easy, he had to count on the visual knowledge of old farmers who could indentify instantly the nature of the vines by their leaves. what looks like missing vines are actually the spots where he uprooted these hybrids. He also uprooted a row of Gamay Teinturier, a dark gamay intended to darken the wines. It seems also that the whole plot had several owners at the origin, the rows are not always planted at the same distance, the good side is that the parcel was obviously farmed without machine, the bad side being that the pruning was not made in a disciplined way, this parcel was also for home consumption. They manage to pick the different varietals through several passes, first picking côt and gamay (sometimes grolleau also sometimes not) and the pineau d'aunis needs one more week compated to more precocious gamay. Many of these pineau d'aunis are close to 100-year old, sometimes they still have quite a good number of clusters, so he still hesitates to keep the whole plot or not. Right now, as he still has a few plots with very young vines that are not fully productive, he prefers to keep this parcel which still makes 20 hectoliters by itself. On the other hand for example some old vines of Côt here which seemed too old to produce much suddenly recovered after he took over the parcel and took care of them and now they're bearing a respectable number of clusters, so in fact he stilm doesn't know whazt he'll do with this complanted parcel. Pic on left : 50-year-old chenin, pic on right : grolleau (all in this very parcel). The rootstock on these vines is likely ripestris. He has another parcel on the next hill (Les Dorées) which we see from here with massal selections on clay (here it's limestone) making more powerful wines. The cellars We then drove a short distance to Renaud's cellars, they're typical former quarries, the stones having been extracted from there to build the village houses around here centuries ago beginning in the Middle age. Later, at what time it's hard to say precisely, they were turned into winemaking facilities, cool storage for the food and vegetables, and mushroom-growing rooms. We just left the paved road between bueil and Villebourg and landed in a clearing next to a surfacing cliff, in a configuration pretty similar to Jean-Pierre Robinot's own cellars 18 km away. You find this type of cellar in many corners of the Loire region anyway, but it's always fascinating to visit them because they're all different. Sometimes a house has been built in front of the cellars against the cliff like here, it was obviously thought for the harvest/fermentation days and weeks, when the farmer/winemaker and his aides had to stay near his wine, check the presses and so on. No doubt this was the occasion to gulp down some wine while the women were away at home... Today Renaud's pickers use it to rest and have lunch, it's complete with a fire place, table and chairs, looks like it has been untouched for decades. I should be blasé after having seen many such cellars dug into the rock but each time it is a wonder : these mysterious wodden doors opening on this quiet square under the trees, this is very photogenic, you imagine the scenes when a vertical press on wheels (like some that you can see on this page) would be parked for a few days for a fee so that the farmers could press their production. When they built the openings with doors they even did a refined job like for a house, using blocks of stones for a neat finish, even adding a vault window for a better aeration (pic on left), from close it's almost like entering a church.... Natural sparkling sur lattes We walked into two of these cellars, they're quite deep, there's a fireplace with chimney right after the door (pic on right) and deeper there are lateral rooms of different dimensions. At the beginning of the cellar they sometimes also built a brick vault under the ceiling, probaby to reinforce the structure. In one of the cellars there was a long wall of bottles (6000 of them), this is his natural sparkling 2013, made of 2/3 chenin and 1/3 pineau d'aunis (pic above). He began to make some natural sparkling in 2005 with some gamay that had quite a lot of sugar, he had racked the wine in winter, it was a sort of sugary rosé which he liked the way it was, with 17 gr of sugar, but it could be in the AOC because sugar has to stay within 13 gr, so he was not sure it would sell (at that time he still bottled part of his wine in the appellation). At that time he showed the wine to Jean-Pierre Robinot who encouraged him to stir the wine, bottle it with a crown cap and make pet'nat, which he did and the result was nice. Speaking about when he progressively let down the AOC and switched to table wine, he says that with the AOC you have to know in advance what the varietal composition of your wine will be, to be sure of the volatile level, so it's very difficult when you make real wines that are not always in the box of the AOC categories, plus you have the label problem because if you don't know till the very end if youy'll be in table wine or AOC for a given cuvée you almost have to print two types of labels. You're asked to tell the AOC you'll make 3 weeks after the harvest, which is completely pointless as these types or artisan wines sometimes need one or two years to be ready on their indigenous yeast. Very often he had to return to the Douanes (the French Customs is the alcohol administration) to modify his harvest declaration and check that all the other wine adminitrations like Inter-Loire took into account the modification. Because of all these problems and bureaucracy hurdles which are an unncessary diversion from the real work of the winemaker (the quality of the wine), he decided not to apply anymore for the AOC, this was at about the same time he stopped adding any sulfites, in 2007. Pic on left : a rusted corking tool The chai Back in the Citroën van we hopped to the chai a short distance away, that's a small building where Renaud has his press and fermenters. There's a courtyard in front which he plans to cover with a concrete slab and he has more plans to make this building more convenient for his harvest tasks. Rhis may not be obvious from the outside (pic on left) but this building is backed to the slope and is half underground which keep the temperatures cool. On the side there's a Vaslin press but in its place there was an old vertical press with its wood cage and stone bed to funnel the press juice. The building has indeed a long winemaking history before Renaud setlled in. The fermenters are fiber vats as well as plastic vats with floating lids that can be used also for storage. I thought that I had seen all of Renaud's cellars but he has another cellar here, the door of which opens in the wall in the back (picture on right). Renaud brought a bottle of the natural sparkling 2013 from the previous cellar and I get a first glass of his wine. The sparkling has a yellowish turbid color, it's 2/3 chenin and 1/3 pineau d'aunis but it's definitely a white. Very fruity, Renaud says that the pineau d'aunis brings raspberry notes. It's dry with tension and fine bubbles. He still ponders if he begins to disgorge a few bottles, the ideal would be to keep them 18 months because the potential of 2013 is good. After the disgorgement he'll have to leave the bottles lying for another 3 months, letting the wine reclaim some roundness and oxygen in the process. He is not hurried, he'll take the time it needs. he plans also to turn all the bottles (he already did it once for this vintage) which means that all the bottles have to be moved and piled in another "wall", this operation adding a bit of richness into the wine. He sells this wine 8 € without tax. Renaud says that 2013 was a good vintage for a bubbly. Asked about the residual sugar or the lackthereof, he says that's not something that can be controlled easily, sometimes you have 20 grams when you put the crown cap and you end up with only 5 at the end, or you bottle with 25 and no sugar at all at the end but too much pressure, it's pretty tricky, there's no easy recipe. He personally prefers dry bublies and same for his clients. This year, contrary to the previous years, the fermentations were very long to start, it took more than one week but then it moved fast, and at one point he even realized that the sugar was dropping fast and he had to bottle hastily. Rootlets hanging from the ceiling Renaud bought this chai and cellar in 2005, the galleries were empty, just a few empty bottles lying in the dark and covered with dust, he dug the ground in some parts of the cellar galleries to level it and have an horizontal base (a bottle wall needs to stand on a perfectly-plane floor ! ), he also enlarged a small lateral corridor connecting the two main galleries (it's quite big in here), he also put some electrical wiring and lighting, just some basic stuff to be able to move and store things, and the real good thing, especially for natural wine with zero added SO2, is that it's totally stable from winter to summer, 13 ° C year around [55,4 F]. The whites are pressed with this 20 or 30-year-old Vaslin press which is doing a soft job, he says. The juices are pumped into a 40-hectoliter vat above for a while to let the lees settle down, then just by gravity the juice is hosed into the barrels in the cellar where the fermentation will take place. When bottling time will near he'll push the wine out of the barrels with nitrogen or simple air into a blending vat for the racking, and later, just by gravity with a 4-spout bottle filler he'll make his bottlings the artisan way. He says the white vats in the background (CMMC Vaslin) are pretty useful for these operations, they're made in polyester but quite thick and with a special lining for food and beverage and the whole provide a good temperature inertia. Anyway it's never hot here because the harvest is at the turn of october and the building sits in the shade. If he nneds cooler temperature he can move a vat briefly outside for the night (nights are cool in october). For the reds I ask if he does carbonic maceration on them but he says it's rare actually : sometimes part of the grape load is destemmed, sometimes the whole batch, the grapes are unloaded in the vats by hand and left there to macerate without pumping over and very little cap-punching. He pumps a bit of CO2 from the neighboring vats over the grapes at the beginning. After 2 or 3 weeks he lets the free-run juice flow and forks out the grapes for the pressing, both juices being pumped together into the vats above, after which like for the whites they're hosed into barrels in the cellar by simple gravity to finish their fermentation. All of Renaud's wine goes into casks, except his cuvée Le Gravot, a red thirst-wine blend which eschews the barrel stage if he lacks room. Opening a bottle Renaud Guettier makes about 6 cuvées on normal years, last year being special because he'll make only a still red and a whire natural sparkling. On normal years again he makes between 10 000 and 15 000 bottles (last year only 9000). 10-15 000 seems low for 6,5 hectares but there is a 1,5-hectare surface which is too young to produce grapes, this will be better in 2 or 3 years from now. With yield at 25 ho/ha on average for his old vines it's not really possible to produce more, plus, frost and hailstorms tend to shrink it even more on some years. That's why his prices reflect this situation, he sells some cuvées at 8 € without tax which will translate into 15 € on the retail side. __ La Grapperie, Le Pressoir de St Pierre 2011, dry chenin, vin de France (table wine). this is the cuvée with the shortest élevage time : 24 months (some back lables still state 18 months but he now does everything at 24 months minimum). These are terroirs on Saint-Pierre on the upper slope part with a rather sandy soil with silica (the mid slope being stony and the lower slope clayish). Very aromatic wine, open and with flower notes (RenauD feels acacia and linden), rich in the mouth which still a good acidity even after this long élevage. Le Pressoir de St Pierre, table wine, white wine 100 % pure grape juice fermented without any additive. Terroir : clay with silex on limestone (sandstone) - Vineyard : vines aged from 40 to 100, plowed and farmed without herbicides or chemical insecticides - varietal : Chenin - Harvest : picking by hand at full maturity with sorting under the row - Elevage : 18 months on lees in oak casks in our cellar dug into the sandstone. Natural vinification without enological additives in order to preserve the purity of the grapes and the expression of the vintage and the terroir. - Bottling : By gravity, without filtration and without preservatives. - Serve : Sediments can form at the bottom of the bottle but are no harm to the quality of the wine. Carafing may be necessary, for example to let the natural antioxidant in the wine, the CO2, go away. - Conservation : keep your bottles lying at a stable temperature under 14 ° C. Adonis : 100 % Pineau d'Aunis __ La Grapperie, Les Dorées, Vin de France (table wine) 2010. You can guess the year by reading a small code printed veically where you find also the bottling day, making the information very complete for demanding amateurs (this chenin 2010 was bottled on the 6th of june 2013). This comes from a 100-year-old vineyard, a parcel names les Dorées. The wine is riper, richer with aromes of mirabelle. Renaus used old oak, he buys his casks second hand, when they're already 2- or 3-wine old and he keeps them as long as they're good. The wine is indeed different, more powerful and classy. Nice wine. Costs 20 € tax included (retai). All these wines are table wines (Vin de France) and the bottles are thus capped with the usual blue stamp (capsule bleue) of table wines (pic on right). __ La Grapperie, la Désirée 2008. Chenin with 60 months of élevage. Zero SO2 also. He began to make this cuvée in 2007 after keeping a wine for 3 years because it wouldn't finish its fermentation. The wine has a salty energy which I like, very interesting wine. It's a blend from several parcels in the sense that he put together certain casks (the ones that had a slugggsh fermentation I guess). None of these wines are filtered, and I guess the very long élevage helps in this regard. He sells this wine 28 or 30 € tax included (15 € without tax). I lije te wine the way it is now but Renaud says that with 5 years of élevage and one year in bottle it's too early to drink it now, its potential will grow and open even more after a few years. __ La Grapperie, Adonis 2012, red table wine. 100 % Pineau d'Aunis, blend of several parcels, mostly from 40 to 80-year old. 12 months of élevage. A delightful pineau d'aunis, with generous late-summer flower aromas, peony in particular, beautiful nose. Touching color too, not very dark and with milky shades. he says he doesn't macerate much which explains the light extraction of color. He says he prefers to keep the freshness and the fineness. This wine goes down easily, very enjoyable wine. He says the 2012 opens quickly after the bottle opening. Renaud's first vintage was in 2004, there was not much wine then because he had only a half-hectare parcel at that time, and he sold the wine to friends but he also drove to Paris to show his wine to Michel Moulherat of the Cave de L'Insolite (a wine shop that changed hands since), and also to Nadine of Au Nouveau Nez. Today he has about 60 clients in Paris. Renaud went also to different wine fairs and he joined the natural-wine group "Les Vins du Coin" which has wine events a couple of times a year (he is bnow the president of the group). He also went to other wine fairs and joined the AVN and Les Vins Sains, meeting Jean-Pierre Robinot who lives 15 km from here. His first exports were in the United states with Jenny & François, he later sold to Garagiste (Seattle) and now has another importer in Seattle, Owen Kotler Selections (if I'm right). He is selling on and off to Canada (Quebec). He sold to japan, first with Oeno Connexion, then Diony. He sells to Sweden through Emil and Ulf of Vin & Natur, to Denmark through Vinsvin and to Belgium through Altrovino. Square church at Saint-Laurent-en-Gätines I passed this strange monument in a village nearby Bueil, this was in Saint-Laurent-en-Gâtines (pop 949) : a 25-meter-high square church built with bricks in the 15th century, but I learnt that originally it was not a church but a fortified seigniory (named Grand'Maison) with more windows than today. It was turned into a church in 1875 because it was cheaper than build a new church from scratch. When I first saw it I thought it was an old granary building. It 's even more interesting for us as we're settling ourselves in Dissay over 1.5ha this year and it's very helpful to get access to all these crispy details about the winemaking and vines training.